ApexNetwork Physical Therapy will be expanding soon into Kentucky! We will be opening in Frenchburg, KY in April of 2017. The clinic will be located at 814 Highway 36. The Frenchburg location will be the first in Kentucky and joins a network of over 50 nationwide clinics. ApexNetwork looks forward to providing rehabilitation services to Frenchburg and the surrounding community. The Frenchburg clinic will provide rehabilitation services in the following areas: physical therapy, sports rehab, hand therapy and manual therapy. 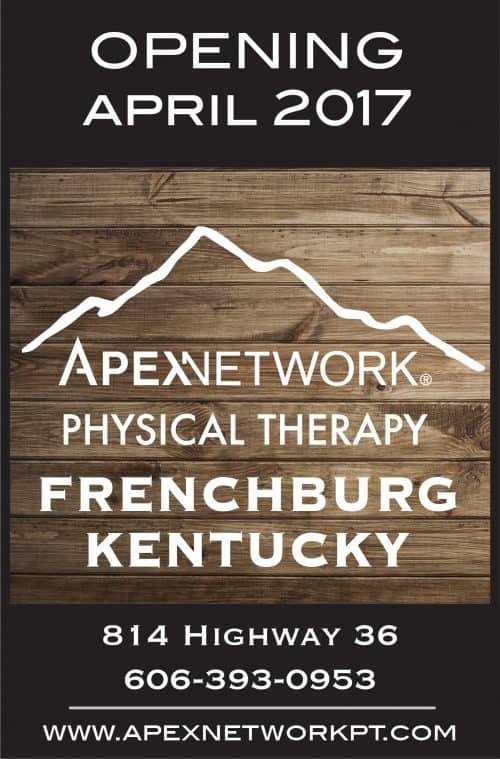 ApexNetwork Physical Therapy Coming Soon to Frenchburg, Kentucky!